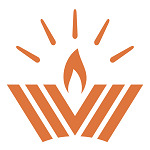 The Mitzvah Volunteer Program meets on 4 Sundays (Feb 10, Feb 24, March 3) at Chabad of Fairfield (452 Brookside Drive), from 5:00-6:30 pm. 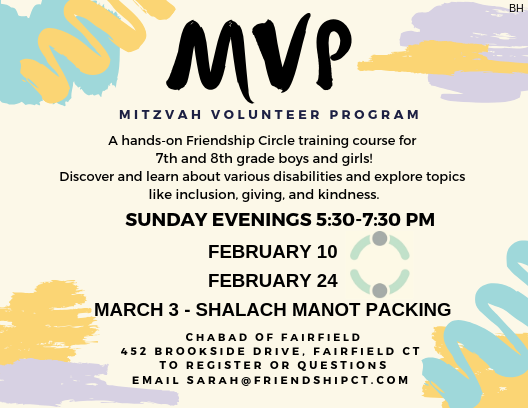 The MVP is a Friendship Circle Training Course designed to teach pre-teens about accepting differences, various disabilities, and the importance of giving to others - particularly children and families with special needs within our community . These skills are taught and practiced through interactive games and discussions, and hearing from special guest speakers - including specialists and parents of children with special needs. At the conclusion of the 4 week course, participants will choose to volunteer at two specific Friendship Circle programs, and make a huge impact !